ABC News reports on a recent meeting of ultra-rich, ultra-powerful Americans like Bill Gates, Oprah, and Warren Buffet entirely in terms of them being a Super Friends-style consortium of superheroes. The group, which has a net worth of $125 billion, gathered to discuss philanthropy and other world-saving activities. 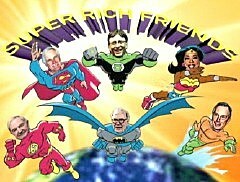 In the photoshopped image created by ABC, Ted Turner is Superman, Bill Gates is Green Lantern, Oprah is Wonder Woman, George Soros is The Flash, Warren Buffet is Batman, and Michael Bloomberg is Aquaman.